Since 2008, Light Project has operated at the forefront of lighting technology and control. 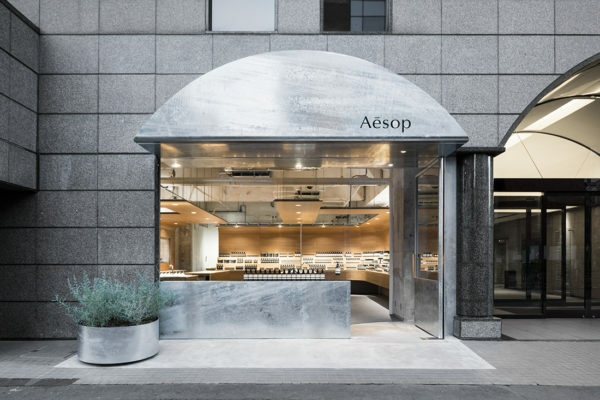 We specialise in architectural lighting, delivering award-winning lighting innovation to clients across fields of architecture, design, engineering, development and construction. commercial, residential, hospitality, retail, education and infrastructure sectors. We work with you and for you, creating custom fittings where specified, enhancing your design intent with intelligent lighting products. 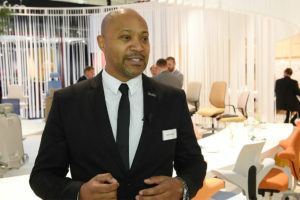 When is a showroom not a showroom? Whenever Mercedes-Benz launches a new Me Store. Mercedes Me Melbourne inhabits a shell by Woods Bagot, as part of the Rialto Towers street level refurbishment. Secret rooms, killer art and a formidable piece of architecture – Raft Studio’s dramatically dynamic workspace by Edition Office makes a fitting headquarters for the avant-garde graphic design squad. 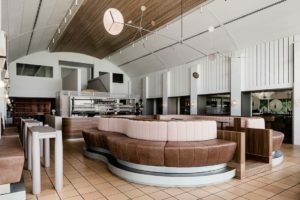 Capturing the refined exuberance of an expertly poured glass of bubbly, Foolscap Studio’s sumptuously reimagined Domaine Chandon winery brings renewed effervescence to a well-loved Yarra Valley destination. 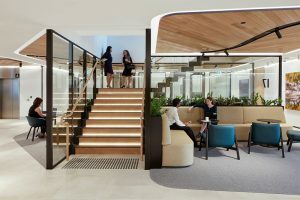 The National Australia Bank’s (NAB) Brisbane Headquarters, NAB Place, designed by global architecture firm, Woods Bagot, sets a new benchmark in collaborative workplace environments. 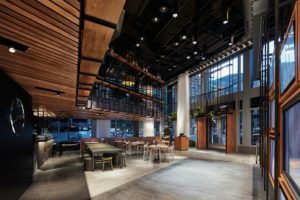 When builder/developer Mirvac decided half-way through the development process for the EY Centre at 200 George Street, Sydney to move their headquarters into six levels of the building, it was a vote of confidence in their own project. 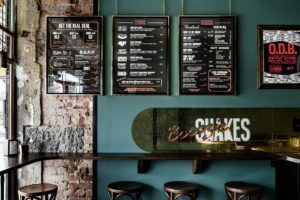 Biggie Smalls’ new Windsor restaurant blends street art and hip-hop influences with an elegant New York City diner aesthetic. What are the principles and strategies behind designing for incidental staff collisions and chance encounters? 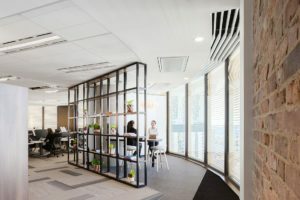 Siren Design maps out its creative thinking and approach for Powercor CitiPower’s BEON Energy Solutions, Melbourne: a purpose built workplace which encourages its staff to ‘interact’ and ‘collide’. 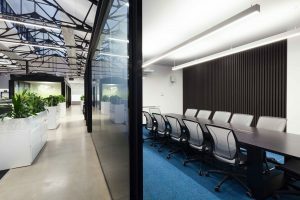 Workplaces are no longer just singular production hubs, but company showrooms used by and with clients. 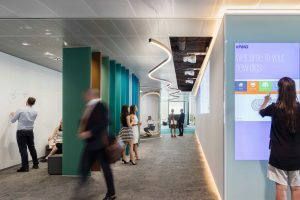 Designed by Davenport Campbell, the new KPMG headquaters in Barangaroo transforms the brave new world of agile working into a workplace to call home. 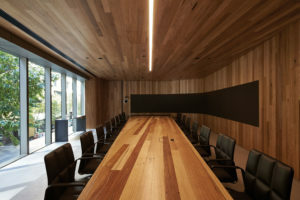 When do the rules and theories of contemporary workplace design not apply? 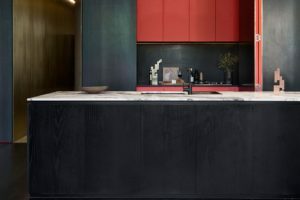 In the case of Woods Bagot’s new Melbourne headquaters, project lead Bruno Mendes threw the rule book out and picked up a cookbook instead. What does it take to redesign a tried and tested model? 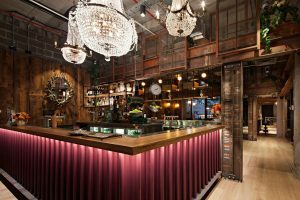 For centuries, the iconic Australian pub has shaped our country’s communities, quenching the thirsts of millions of Aussies and offering social solace at the end of a long, hard day. This side of the new century, our shifting lifestyles, played out in the concrete jungles of our capital cities, has bred a new brand of beer o’clock. But just how ‘refreshing’ is it?